Jody Harrington had a bad start in this July 1989 game. The Elizabethton starter was greeted in the bottom of the first by a Princeton team that racked up seven runs, including a bases-clearing double, according to The Bluefield Daily Telegraph. Harrington ended up getting two other starts for Elizabethton that year, along with six relief outings. His ERA never really recovered. It came in on the season at 9.72. 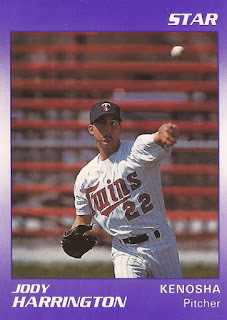 Harrington's career began in 1988, taken by the Twins in the 10th round of the draft out of Armijo High School in Fairfield, Ca. Harrington started with the Twins at rookie Elizabethton. He got four relief outings that first year, giving up four earned in 6.1 innings. He returned to Elizabethton for 1989, getting those nine total outings, giving up 27 earned in 25 innings. He walked 29 and struck out 22. For 1990, Harrington moved to single-A Kenosha. He got 22 outings, one start. His ERA came down to a good 1.74. He also picked up three wins and one save. Despite the numbers, it was his final year in affiliated ball. Harrington is credited with coming back four years later, in independent ball. In 1995, Harrington got three relief outings with independent Winnipeg and five outings with independent Sioux Falls, ending his pro career.